Jersey Water Works has convened a collaborative task force to develop practical and effective policies for eliminating lead in New Jersey’s drinking water. Jersey Water Works has convened a collaborative task force of experts from water utilities, trade associations, environmental groups, academia, advocacy and community development organizations, and all levels of government to develop a practical, broadly-supported action agenda to eliminate lead in drinking water throughout New Jersey. Concentrating on residences, schools, day care centers and small businesses, the group will examine the existing legal and regulatory framework as well as issues of health risk, transparency, environmental justice, public education and cost. In September, 2019, the Task Force will release a report highlighting a prioritized list of short and long term solutions that are appropriate, actionable, efficient and coordinated, including clearly-defined responsibilities and commitments. 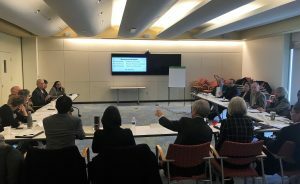 The task force’s kickoff meeting took place in December 2018. Though the dangers of lead exposure have been common knowledge for many years, the problem persists. Lead poisoning poses a particular threat to young children, causing irreversible damage to the brain and other vital organs that impedes learning and development and can trigger serious behavioral problems. In New Jersey, an estimated 200,000 children under age 6 have lead in their blood and of those approximately 4,800 have elevated blood readings at or above five micrograms per deciliter, the level at which the Centers for Disease Control and Prevention recommends that public health action be initiated. The state also has approximately 350,000 homes and small businesses with lead service lines (i.e., from the street to a building), ranking fifth highest in the country. Ironically, though lead poisoning is one of our most pressing health challenges, it is entirely preventable. With a grant from the Fund for New Jersey, staff support is provided by New Jersey Future, a nonprofit, nonpartisan organization that promotes sensible growth, redevelopment and infrastructure investments in the state and facilitates the Jersey Water Works collaborative. Questions about the JWW Lead in Drinking Water Task Force? Contact Gary Brune of Jersey Water Works’ backbone staff, 609-393-0008 ex. 119, to learn more. Resources on Lead in Drinking Water – This part of the website contains tools and resources relevant to lead in drinking water.